The Pedi Comfy™ Functional Hand Thumb Orthosis Splint with Finger Separators have foam-encased malleable wire skeleton that bends to accommodate any angle and fits a wide range of sizes. Progressive splinting is easy. In addition to the standard Comfy features, this unique orthosis allows for control of thumb abduction. 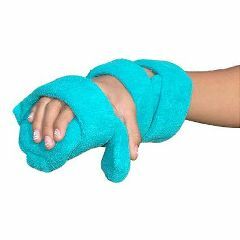 Excellent for treating non-fixed contractures of the wrist, hand and fingers. Unique wings provide thumb support to prevent abduction of thumb without stretching the thenar eminence. The kit comes with a removable finger separator that can be positioned to protect and prevent pressure areas between PIP and DIP joints in any angle. Fastens to strap when orthosis is not being worn, so it won't get lost. Fits left or right hand. Is this product refundable if it is not comfortable, or causes pressure sores?